Fives/Salzgitter Mannesmann relationship strengthens, following second Bronx tube straightener Contract award. Bronx Series 6CR12-HD straightening line, installed in Japan. 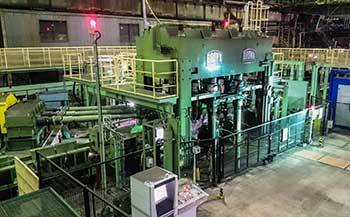 Fives are pleased to confirm the successful installation and commissioning of a Bronx Series 6CR12-HD straightening line, for a leading API tube manufacturer, located near to Osaka, in Japan. The line was ordered primarily, to process large diameter seamless steel tubes up to 426mm, possessing wall thicknesses of up to 50mm and at temperatures of up to 750 degrees Celcius. Jon Dunn, Managing Director at Fives Bronx Limited, went onto explain that "the Contract award represented a very significant success for the company, as the order was secured despite fierce competition from many other suppliers. The client however, recognised the need for a very strong, and rigidly constructed six-roll solution, and the Bronx offer, fully met with their requirements. Whilst we have sold physically larger machines to other clients, this particular application bought about the need for a machine having a much-increased design load, due in the main, to the high material yield strengths and combined wall thicknesses of the product.” Mr Dunn went on to add " When reviewing the list of Users that we possess worldwide, it is noticeable that the vast majority of our references, whether for 6 or 10 roll solutions, are for both hot and cold, thick-walled seamless tube applications. As most of our clients have multiple installations at their plants worldwide, this speaks volumes regarding the reliability and longevity of our equipment."